If God is sovereign over all things, then is it possible to affirm human freedom and dignity in any genuine sense? Must not God’s “all-encompassing will” necessarily pose a threat to our sense of liberty, happiness, and dignity? In his latest book, God, Freedom & Human Dignity: Embracing a God-Centered Identity in a Me-Centered Culture (IVP Academic, 2013), Ron Highfield, Professor of Religion at Pepperdine University, proposes an alternative to the framework found in Western philosophical thought that places God’s will and human freedom in a competitive relationship. This book is a helpful entry point into some very important conversations, and I think Highfield does an excellent job of framing the problems and posing the biblical responses to these issues. What follows is my brief review and summary of his work. The “me-centered” self is what Highfield calls the modern Western understanding “not because it is especially selfish or narcissistic but because it attempts to create its identity by sheer will power and rejects identity-conferring relationships unless they are artifacts of its own free will” (17). He traces the development of this “inwardness” though Western philosophical thought to arrive at a place where many find it difficult, if not impossible, to affirm traditional Christian attributes of God like omniscience and omnipotence while also affirming in any meaningful way the notion of an autonomous self. There exists only a competition of wills between God and man. This competition produces three reactions: defiance, subservience, and indifference. The ‘Promethean’ posture rejects God’s power and adopts a defiant stance that may be falsely perceived as noble. The subservient posture, found throughout “default religion” (49), adopts a “fear-based or reward-focused” stance that may appear to love God but, in truth, is motivated only be self-interest (63). The indifferent posture is not taken consciously but is a stance adopted through immersion in the pursuit of the esthetic, conformist, or celebrity identity and is “as unaware of itself as it is of God” (65). These reactions operate under the assumption that “A being’s dignity increases or declines with their level of independence” (96). Therefore, the modern self fears God’s omnipotence because it sees it as a threat to our ability to act freely and it fears God’s omnipresence because it sees it as an impediment to the construction of an autonomous “inner self”. Yet despite our desires, our sense of freedom and dignity is often limited by our circumstances to the point that “Vast energy is required to sustain the illusion that the self is in control, that its dignity is rooted in its own powers” (111). If our freedom and dignity are illusory, then what is left? Highfield proposes new grounds upon which we can base our identity, dignity, and freedom by contrasting what he calls “the God-centered self” with the “me-centered self”. To do so, he first explores the biblical view of God’s self-giving nature. The “irony” of God’s omnipotence being most fully displayed in the “weakness” of the cross must be considered, for “Apart from the cross we cannot know the deepest ground of God’s dignity” (123). If God possesses ultimate freedom and dignity, and if this kind of self-giving love is what constitutes true freedom and displays genuine dignity, then our understanding of these concepts must be reformulated. At this point, Highfield examines the person and work of Jesus Christ, in whom we find “a new image of humanity, a plausible understanding of the self for whom it is alien to compete with God or harbor envy toward God” (151). Jesus Christ is no mere example, however. Through faith we are united to him and adopted by the Father, and it is through this relationship that we gain “further insights into our true identity” (159). When we move from being ‘in Adam’ to being ‘in Christ’, we not only find our “true self” (which Highfield correlates with the “new self” of Colossians 3:9-10), but also the only real grounds for human freedom and dignity. 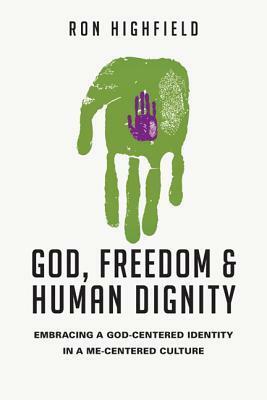 Christian freedom, Highfield argues, is found in Christ and the love of God is the “ground and measure of human dignity” (191). God’s own dignity “is both inherent and relational” and he chooses to bestow dignity on his children “by loving them” (201). Human freedom and dignity are not inalienable rights; they are conferred upon us by God and grounded in Christ. “By loving us with the love of God, God bestows on us the highest dignity conceivable and frees us for the most perfect freedom possible” (206). This understanding eliminates the false sense of competition between God’s all-encompassing will and our creaturely freedom. It also enables us to move past the postures of defiance, subservience, and indifference that characterize the modern “me-centered self” and frees us to “exist as our true selves and exercise genuine freedom” which can only happen “by loving God and loving others” (213). I found Highfield’s book to be an accessible and thought-provoking foray into the debates regarding how a Christian concept of God relates to the philosophical concepts of freedom and dignity. His insistence that we can only rightly comprehend and experience these things in Christ is a welcome corrective to many other treatments of these issues. This book charts an excellent course for how to engage the modern and postmodern quest for dignity and freedom with the gospel. The truth is that our highest dignity and deepest freedom come from knowing that “I have been crucified with Christ. It is no longer I who live, but Christ who lives in me. And the life I now live in the flesh I live by faith in the Son of God, who loved me and gave himself for me” (Galatians 2:20).